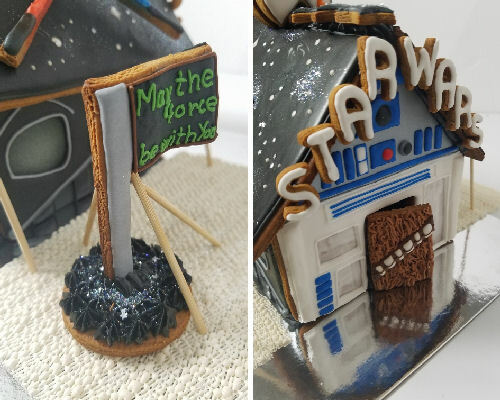 Over the years many of you asked me to make a Star Wars inspired Gingerbread house. At the time it seemed like an impossible task to accomplish. It felt like it was too complicated and honestly I was a little overwhelmed by the idea. On the Christmas Eve last year I was sitting in the living room and as always there was a sketch book on the coffee table. I keep it there just in case I have an idea and need to make a sketch. I quickly drew some basic design outlines and there was no going back. 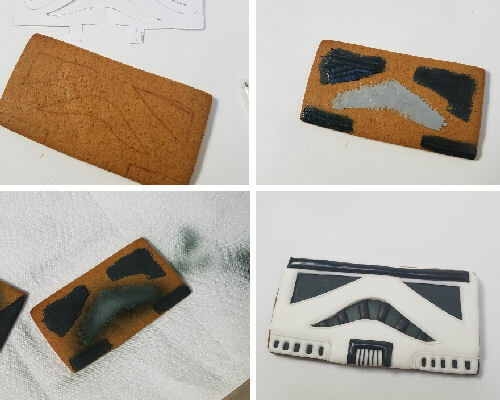 This Star Wars house looked so fun on a flat piece of a paper that I had to bring it to life. I got up and baked the gingerbread panels, cut out decorating templates and prepared royal icing. I worked non stop on this gingerbread house as if I was possessed by some unstoppable force, really looking forward to the final product. It didn’t disappoint and I hope you like it too. 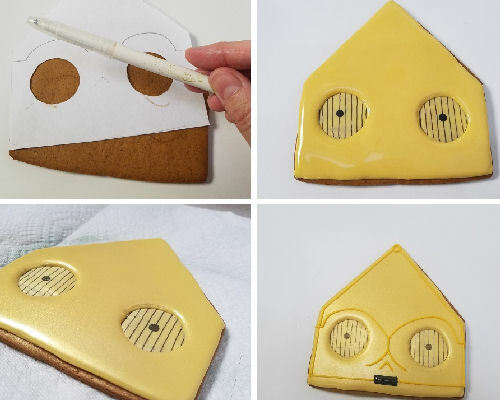 Gingerbread panels can be baked ahead. Since there are not for eating you can bake them a week or 2 before decorating. Store them in an airtight container if you do so. Bag the icing on the day you plan to decorate. Royal icing separates as it sits. I you see any separation, remix the icing. You can also gently massage the bag to reconstitute the icing. 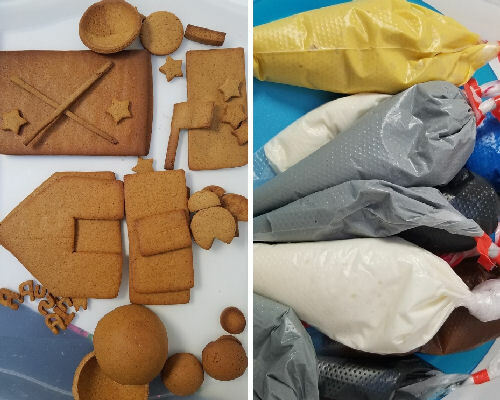 Generally speaking I like to prepare my flood 1st and then once I’m ready to use icing for the details I bag it just before using. If you are a beginner decorator and don’t own some of the tools I’m using. Solutions are usually easy to find. 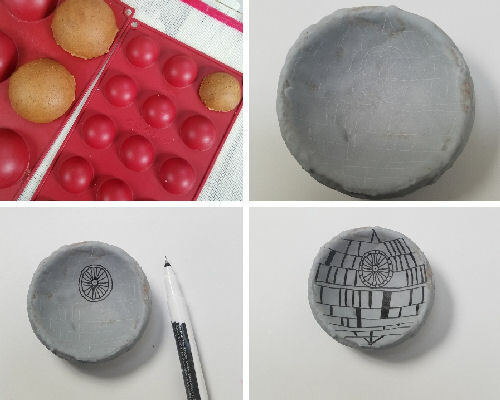 For example if you don’t have a half sphere silicone mold to bake the death star. Shape the foil into a ball. Use it to bake a curved round cookie. To balance it on the baking sheet you can use a canning jar band or flatten one side of the foil slightly so it won’t roll on a baking sheet. You don’t have small letter cutters STAR WARS. No worries. 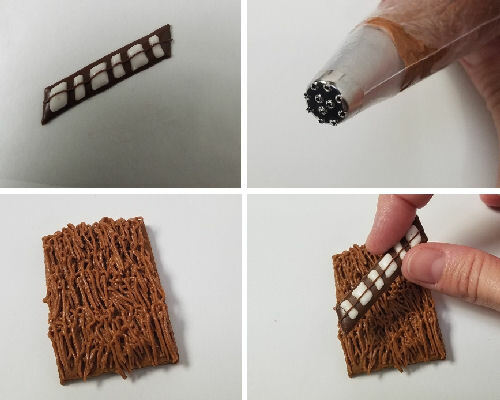 Make royal icing transfers instead. No airbrush? No worries. 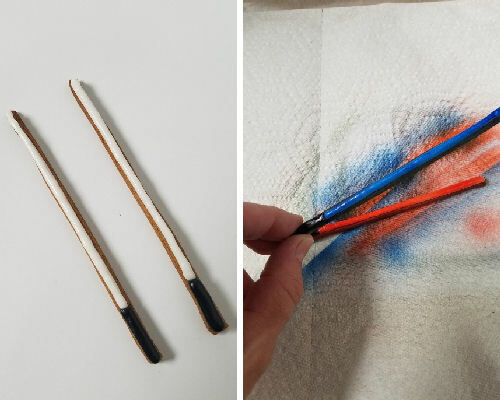 You can easily skip this step or if you really want to include the shading you can use a black marker and use a lightly moistened food only paint brush to create shading. 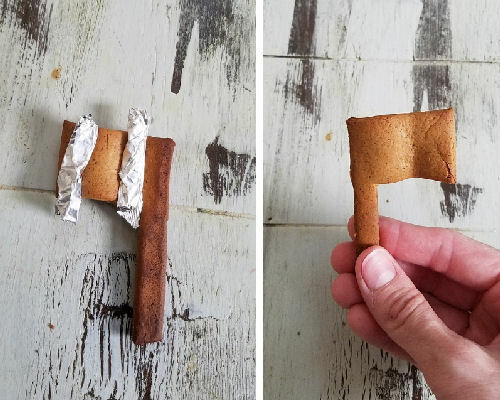 I used a foil to shape the gingerbread flag and to add movement. 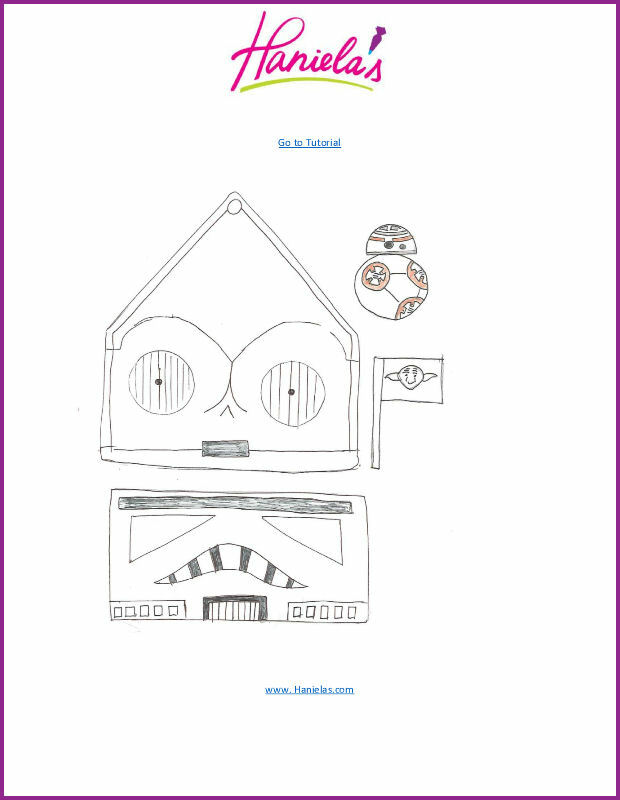 Sides of the house are decorated as the Stormtrooper and the Darth Vader himself. 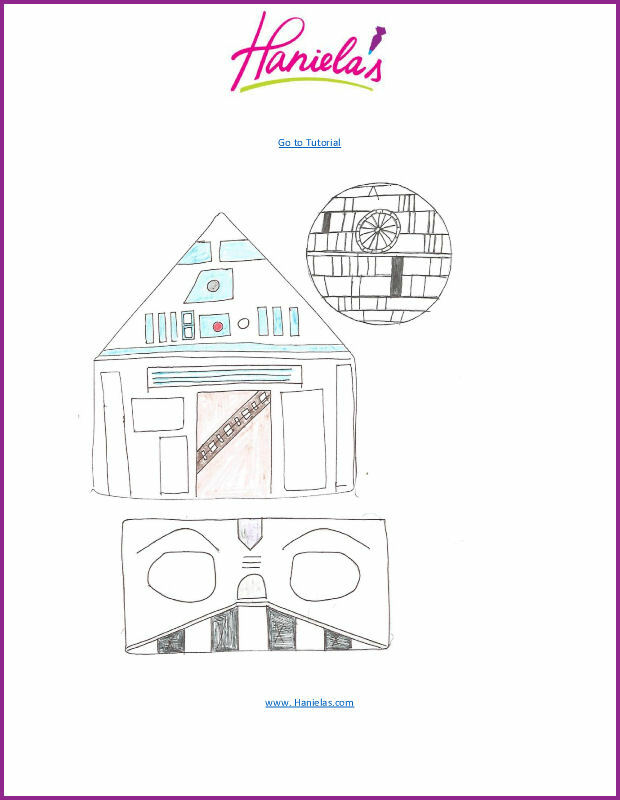 I utilized an eye mask designs to create the windows. I first let the brushed royal icing layer dry before airbrushing with black food airbrush coloring. 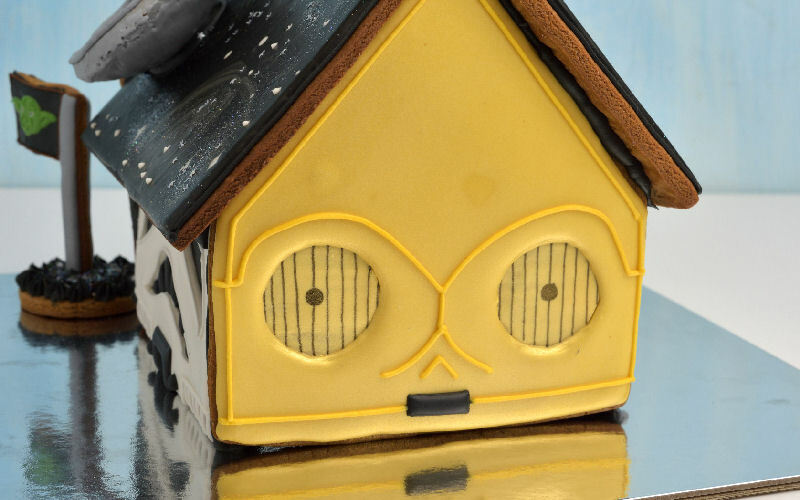 Back house panel is C-3PO. I used mustard colored icing to ice the cookie. Then I let it dry completely before airbrushing it with gold airbrush color. I also used edible marker to make the lines across the eyes. All the details around the eyes, and nose are piped with piping consistency royal icing. I used about 20 second consistency to make the black mouth. 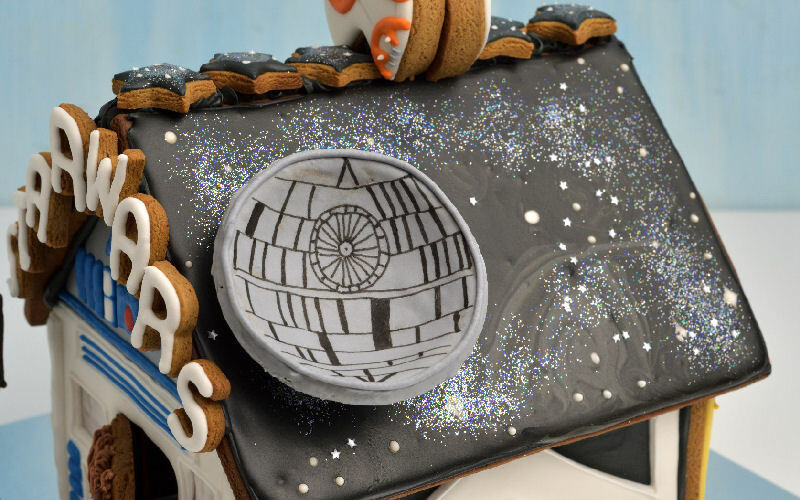 Death Star is represented by a satellite dish. I thought that was super clever to do and I was really proud of myself. I hope you share my passion. Anyhow to make the curved gingerbread I shaped a round unbaked cookie on a half sphere mold. Let it cool completely before decorating. I used thing gray royal icing to ice the inside and the outside of the cookie. Then with a pin I drew the design on the icing. I utilized a fine tip marked and draw the design on the inside of the dish. It’s funny how simple things can end up being the most complicated. In my world anyway. I struggled with the roof design for a little bit, wanting to create galaxy design with bright colors seemed like a good idea but then I realized, not everything has to have pink and purple in it! At the end I decided to go with black, gray and white with edible glitter and silver star sprinkles. It was so simple to make. You can see the process in the video bellow. 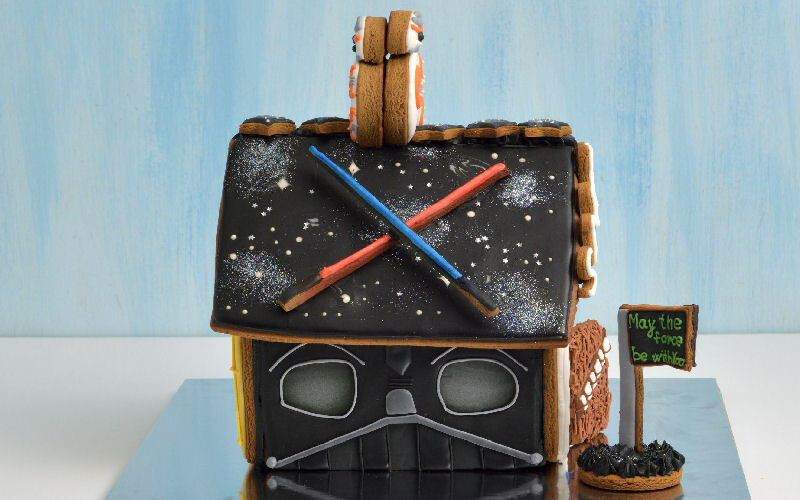 This Star Wars house couldn’t possible be without Chewbacca. Chewebacca door is super cute and easy to make. 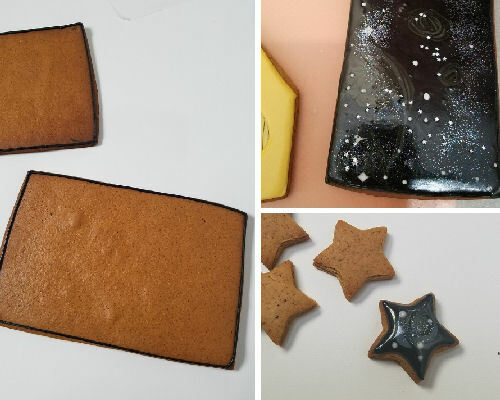 I made a royal icing transfer first and then a grass piping tip to pipe the textured royal icing on a cookie. Make sure you pipe in one direction from top to bottom. Immediately and with care push the dry royal icing transfer into the icing. Be careful not to break the royal icing transfer in half by putting too my pressure on it. If you are not 100% sure how to do it, make sure you watch a video for step by step visual directions. 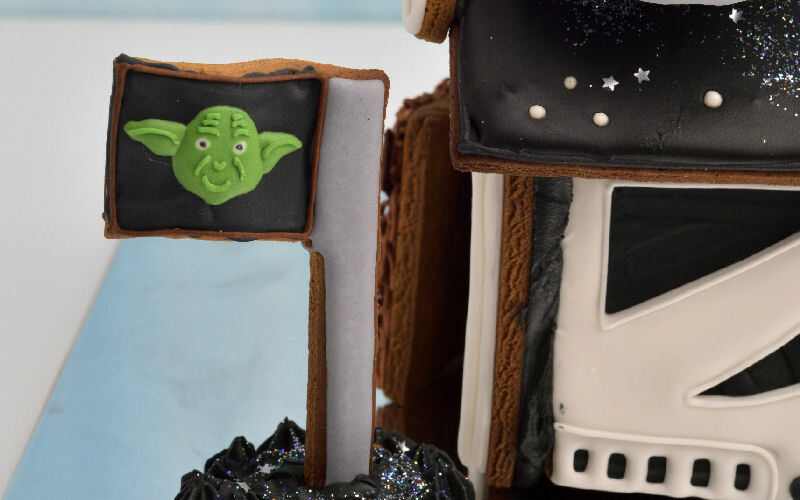 I used thin gingerbread pieces to make the lightsabers. I iced them with black (handle) and white(blade). Then I airbrushed them with red and blue colors. 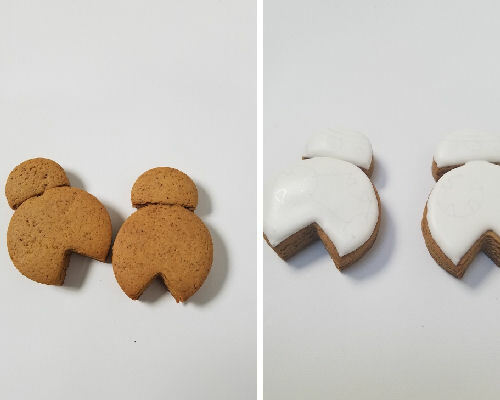 BB-8 was constructed by gluing 2 cookies together. 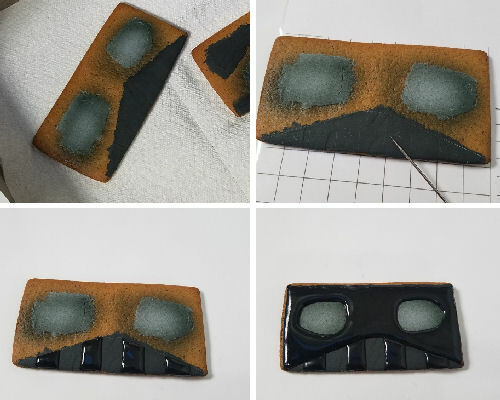 Make sure you use thick icing to glue the panels but make sure it’s not too stiff. If icing is too stiff it will not create a strong bond, too runny and you’ll have a hard keeping the gingerbread panels upright. Let the base structure dry before adding the roof on the top. Use small bottles to support the walls while drying. To keep the roof from sliding use skewers. I use a non stick rubber liner to keep the skewers from sliding. 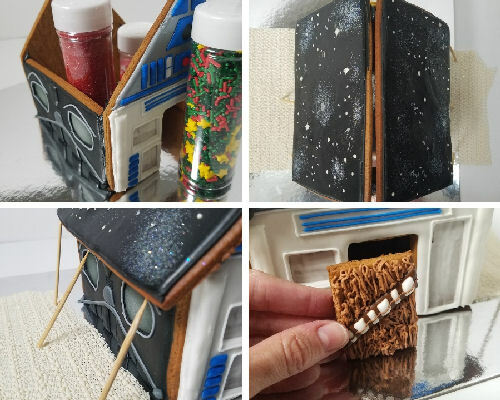 Here is a video where you can see how I decorated each Star Wars panel and how it all came together. Thank you June. It was really fun and and despite all the details it was one of the easier houses I made. What a lucky grandson.